With 2018 rapidly approaching, there’s been some sobering news from an analyst forecast, which predicts that the PC market will continue to decline as more people switch to using smartphones for tasks usually reserved for computers. The report, by credit rating house Moody’s, isn’t all doom and gloom, however, as it suggests that IT spending growth will actually rise in 2018, possibly by around 4% (following a 3% rise this year). In 2016 this actually saw a decline of 2%. The report states that “revenue growth will be driven by equipment and software purchases and services related to the ongoing migration to cloud-based IT systems from legacy IT architectures”. In the report, two companies are singled out as having a particularly strong 2018, with Microsoft and Apple “collectively account[ing] for about half the industry’s operating profit,” according to Moody’s. 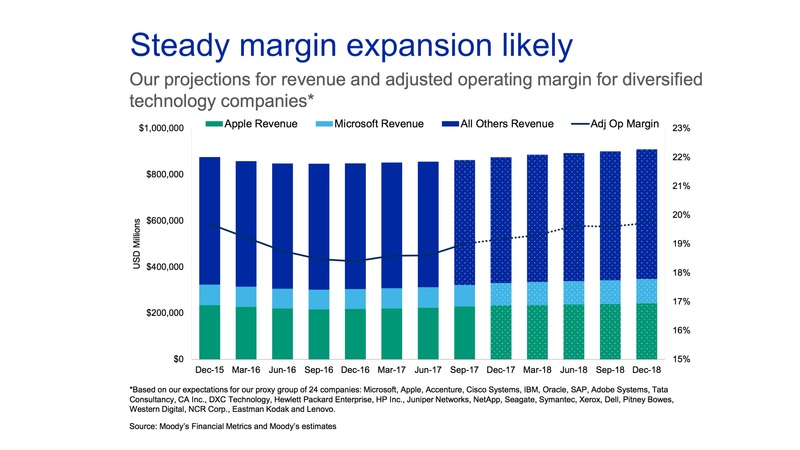 So, as companies replace their ageing hardware and move to cloud services, Microsoft and Apple will lead the charge, and due to their size and influence on the market they will help raise the aggregate revenue of the entire sector. Meanwhile, earlier in December analysts Evercore ISI predicted that Microsoft could reach a $1 trillion market cap by 2020 – if not sooner – as reported by Yahoo Finance. So, while the PC market is still struggling, its two biggest companies look like they will continue to do well. No matter what your opinions of those companies are, their continued success should be welcomed, as it will help keep the entire market afloat. For now, at least.